I have a very large bias against artificial Christmas trees. I understand why they exist and why some people find them more attractive than real Christmas trees. Obviously, they’re portable, compact, easier to clean up after. But those attributes do not make me forget that artificial trees are just that: fake. I grew up with a real Christmas tree each year (sometimes two!) and in my opinion, that is the only way to go. I like the smell of fresh pine. I like the bonding that takes place while scouting out Home Depot, Target, and local Boy Scout troop stands with my family each December. I’m certain it provides more entertainment than pulling a bunch of plastic limbs out of a dusty box from the depths of a closet would. All that being said, I caved and purchased my first artificial spruce in December 2009. I know, I’m a hypocrite. But I bought into the plusses that come along with a fake tree. And admittedly, I was happy that I didn’t have to carry the equivalent of a 60 LB. piece of firewood up two flights of stairs to my apartment and then vacuum up all the tiny needles. My first Christmas with the fake tree did not go so well. I bought a 6-foot blue spruce pine (Wal-Mart blue light special!) that already had lights attached, and the middle of the light strand blew out after a day of being plugged in. Rather than returning the tree ( it was too much effort to put it all back in the box), I decided to just unplug the lights and decorate it anyway. 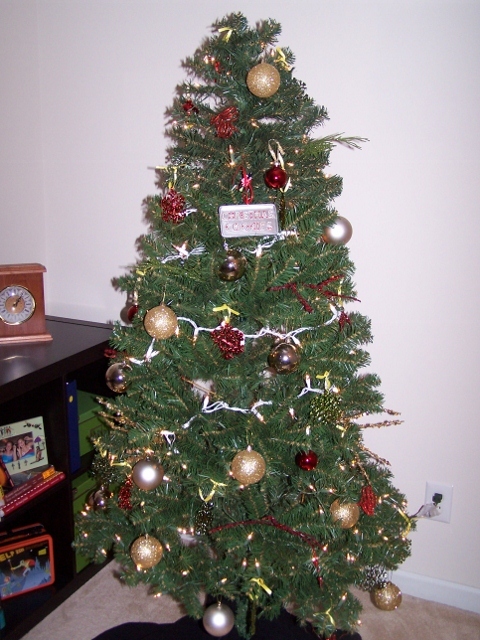 The funny thing is that I re-plugged the tree in a couple days after Christmas last year and all the lights worked! I had hope that it would provide great light in 2010. Unfortunately, my hopes were shattered when after pulling the tree pieces out from under my bed and affixing all the branches together, the middle portion of the lights blew out yet again. This year, I didn’t mess around but went straight out and bought a supplemental strand of white bulbs to fix this problem. I was quite pleased with the finished product in the end, but probably not as happy as I would have been had it been an actual tree. Now that the holidays are over, it’s time for my tree to come down yet again. It may seem late, but the Rockefeller Center Tree in New York City won’t be taken down until Friday, so I figure I still have a little time to call myself “seasonal” rather than “lazy.” Lucky for people in NYC, the Rockefeller Tree will be used by Habitat for Humanity as plywood in future houses. Maybe my pine o’ plastic can be melted down and turned into Barbie Dream Homes? I can only hope. We’ll see what happens next holiday season. I feel like I’ve made an investment now, so I will probably put it up once again. 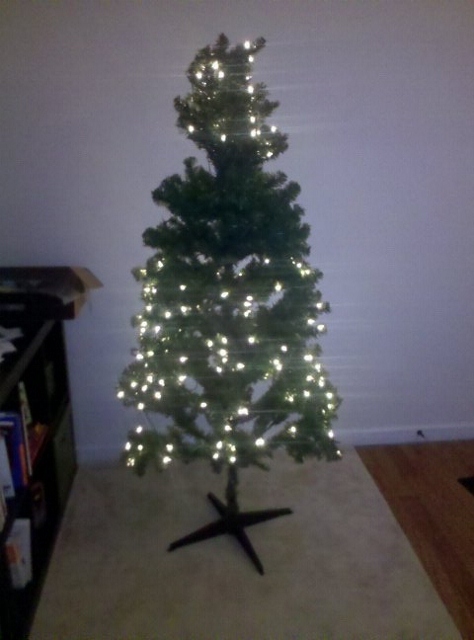 But if I plug in the lights in December and the middle portion doesn’t work, you can bet that I will throw that baby in the dumpster along with my sanity and desire to ever own another artificial tree.